A magnificent wander on a stretch of long isolated beach at sunset and low tide. In metaphysics, water represents the flow of the collective mind - the collective unconscious. It teaches us that our reality is forever changing - never to become what it once was. 'Etchings of the mind' are like memories: some leave traces like indelible ink and some stumble over each other, shifting shape and dancing across the surface. This began as a quick jaunt in the woods near my house. The light was beginning to become bright in the forest and as I walked over mucky soft earth, I was looking for signs of spring. I mostly saw the remnants of winter still, and then I noticed light highlighting textures on the bark of birch trees. I began to experiment with the iPhone and once home I decided the best way to display them was to put 4 images into a gridstyle, following a geometric parquet flooring pattern. This is one of those moments where I was clearly in a hurry and off to somewhere and I noticed something interesting in the peripheral vision. Closer inspection followed, and I already knew I was late, but dug the iPhone out of pocket anyway. The big camera remained sleeping in the house- Click! iPhone pic... Surprise! I like it. There is a place for these 'on the fly' iPhone moments in photography I think. I have seen ice stars many times and they have an 'other worldly' appearance almost like eyes into the depth of the lakes. Recently, I decided to research how they are formed. 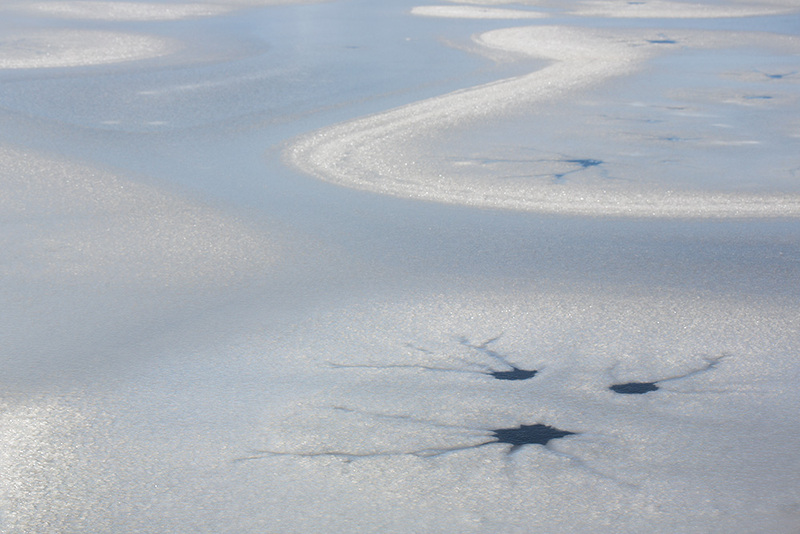 I discovered they are examples of fantastic flow patterns created by water flowing from under the ice onto the snow surface covering an ice sheet often in slushy warmer conditions. The arms of the stars are infiltration conduits that carry upflowing water and drain away from the star. Typically the star refreezes again at cooler temperatures which is what I often see in early morning. An overcast blustery winter day in March with no where to hunker down as I became engulfed by a snow squall swirling around me. The hard bits of rime encrusted snow pellets (graupel) quickly accumulated in the marsh grasses and cranberries bushes laid flat by overwash from the sea. The colours and textures and messy bits seemed to appear like ordered chaos to me.